Anyway, with the December release of the 2017 5-year ACS data, we are able to drill down to the municipal and census tract level. The Census ACS data can be thought of as a 5-year average of the one-year data and therefore has a smaller margin of error but it also tamps down year to year spikes. 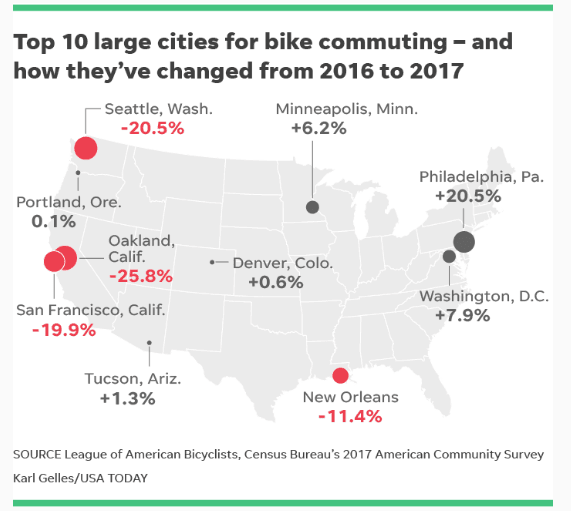 The 5-year data therefore puts the Philadelphia Bike Commuter Percentage at 2.1 percent of all work commuters. When you get down to the Census Tract level you can see the hot spots of bicycle commuters in the City. This year three Census Tracts in the City got more than 20 percent mode share of bike commuters. What’s important to note about these numbers is that they specifically ask about transportation “to work.” That means all students who use a bicycle to get to school, all Philadelphians who work from home but use a bicycle to get around, and anyone who uses a bicycle to get around their neighborhood for non-work reasons are not counted. Philadelphia’s mode share is likely much higher than these numbers indicate. In the eight suburban counties, Tract 40 (Downtown Princeton) reported 224 bike commuters; the entire Municipality of Princeton has the highest mode share of 4.6 percent, followed by the City of Woodbury, NJ, at 3.6 percent. Narbeth has the highest mode share in Pennsylvania Counties (including Philadelphia) at 2.7 percent.